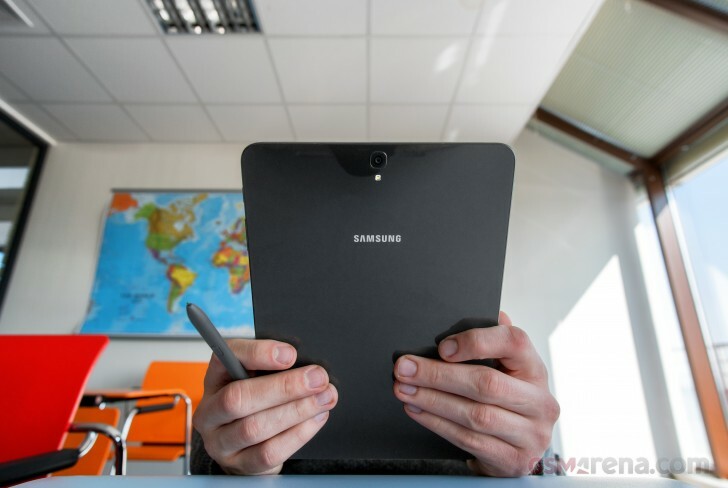 Samsung used this year's MWC venue to throw a curve ball in the somewhat docile waters of the tablet market. 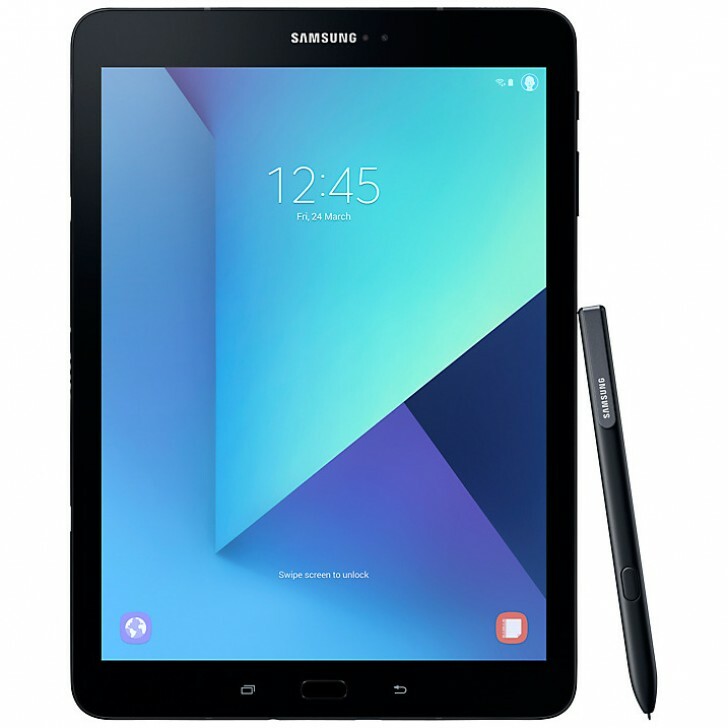 The Galaxy Tab S3 is sure to stir up some commotion, as it is a true powerhouse offer, tricked-out by the Korean giant with all the bells and whistles, including its coveted S Pen tech and a convenient keyboard attachment. The 9.7-inch tablet definitely takes after its Tab S2 predecessor, yet clearly pushes further into high-end productivity territory. It appears Samsung has decided to put forth its best foot forward at making an Android 2-in-1 to take on laptop-like productivity tasks. And just like with its Windows-powered TabPro S, it is hard to judge whether the effort will yield results, but it is clear that no effort was spared in making the Tab S3. Design-wise, the Samsung Galaxy Tab S3 is the very definition of slick and clean. It resembles the Tab A 10.1 (2016) in many aspect and has moved away from chamfering and other distinct details on the older Tab S2. It measures 169x237.3x6 mm and weighs in at 429 grams for the Wi-Fi and 435 grams for the Cat.6 LTE version. A sharp and gorgeous 1,536 x 2,048 pixel Super AMOLED panel on the front, flush glass back with no camera hump on the back and a metal frame - the Tab S3 almost looks utilitarian. It is the perfect chameleon to blend into any setting, business or otherwise. And whether you intend to use it for business tasks or multimedia and gaming, the Tab S3 has the hardware to back you up. 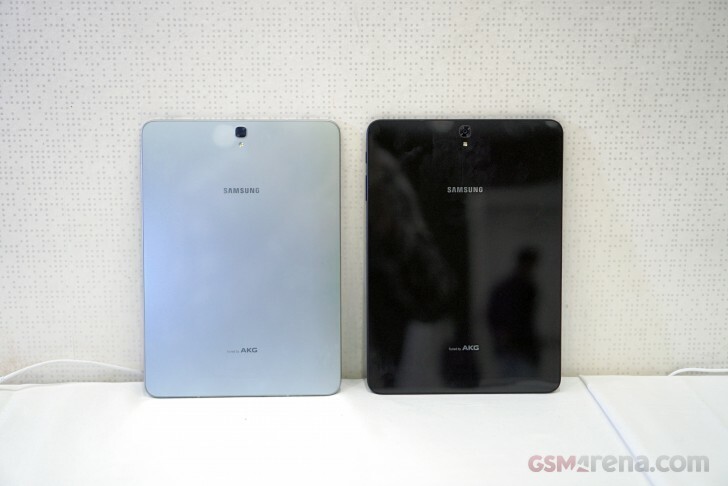 It is the first truly flagship Samsung tablet to come along in a while. Under the hood is a Snapdragon 820 chipset, coupled with 4GB of RAM. Plenty of headroom for multi-tasking on the spacious display. Other notable features include 32GB of on-board storage, easily expandable through a dedicated microSD card slot, dual-band Wi-Fi ac and a large 6,000 mAh battery. Interestingly enough, Samsung has managed to cram a bigger battery than on the Tab S2, while making the unit a tad lighter. It also has a surprisingly thin profile, measuring only 6mm. There are a total of four speakers on the top and bottom sides of the Tab S3. These are tuned by AKG, which makes for a superb audio experience and puts the unit on the same level playing fields as Apple's iPad Pro. Combine that with the 10-bit HDR support on the display and you get a truly amazing multimedia experience. 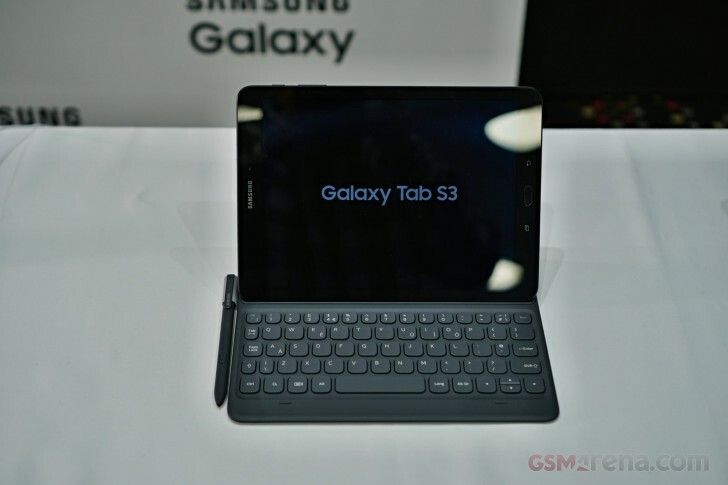 On that rim are a USB Type-C connector, 3.5mm audio jack, a pair of microphones for audio recording and even a SIM card slot on LTE variants of the Galaxy Tab S3. It resides on the same tray, next to the microSD card. 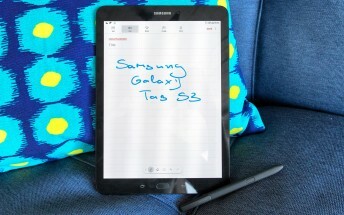 Besides an almost maxed-out specs sheet, Samsung has also included a few accessories to strengthen the Tab S3's appeal as a productivity offer. The left bezel houses a set of six pogo pins and pair of mounting holes as well as some magnets underneath. Those are meant for attaching a passive keyboard accessory, 2-in-1 style, quite similar to the TabPro S. Only this time around its Android doing the heavy lifting, instead of Windows 10. While the latter has the clear edge in terms of true business-oriented software and tools, Samsung has done the best it can to fill in the gaps and make its custom Android just as useful. It's based on 7.0 Nougat and its native Multi Window support definitely helps in this respect. However, Samsung has built on top of that in a significant manner. For one, the Tab S3 comes bundled with the company's coveted S Pen stylus and all the software features to back it up. You can draw, edit, sign. 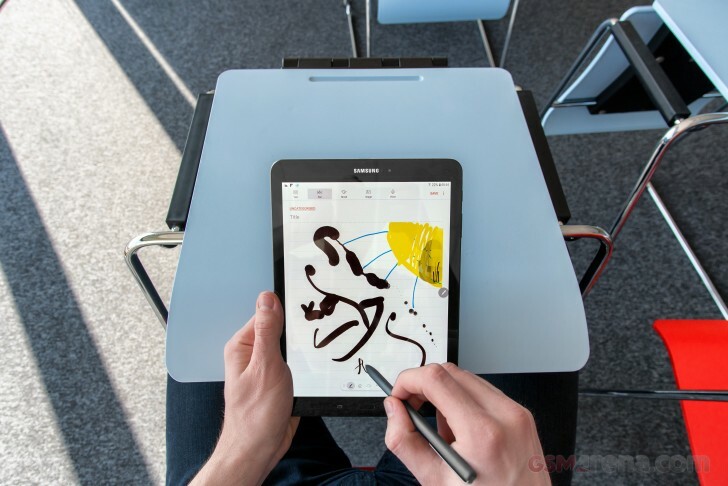 Just like the Apple Pencil and the Surface Pen, Samsung's stylus provides a whole new level of input freedom. Plus, it is good to see the accessory back in the tablet realm. Just like on Galaxy Note devices, it is battery-free and works in the same way. Only this time around, Samsung decide to make it a bit bigger, much more similar to a real pen. The added grip, comfort and control are appreciated, but there is sadly no convenient place to store and carry the S Pen. Unless you get the the keyboard, that is, since it has a lanyard to hold the stylus (but the keyboard is sold separately). To Top things off, the Tab S3 also has a pair of cameras - 13MP, f/1.9 main camera, with single LED flash on the back and a 5MP, f/2.2 selfie shooter. That should be plenty good enough for video conferencing or a last resort occasional photo. Samsung unveiled a pair of Windows-powered, 2-in-1 devices at the Barcelona event as well. For a more in-depth look at the two Galaxy Book models, you can check out our hands-on review.